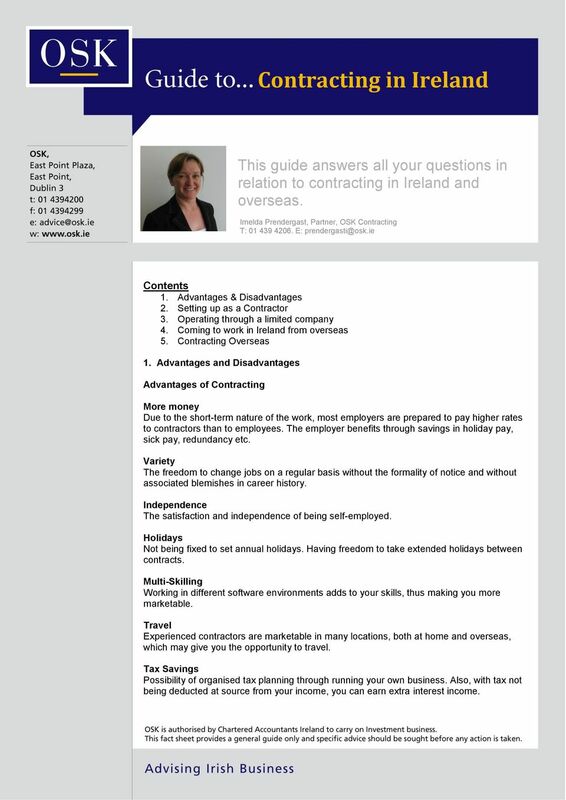 1 This guide answers all your questions in relation to contracting in Ireland and overseas. Imelda Prendergast, Partner, OSK Contracting T: E: Contents 1. Advantages & Disadvantages 2. Setting up as a Contractor 3. 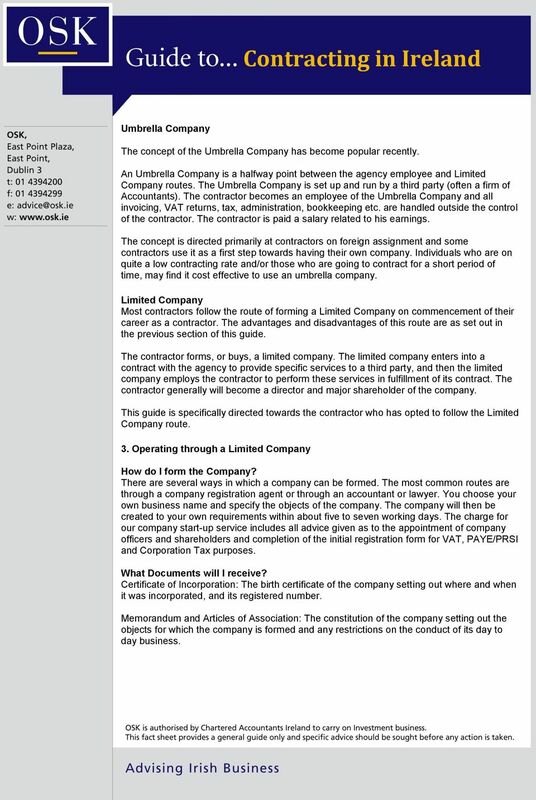 Operating through a limited company 4. Coming to work in Ireland from overseas 5. 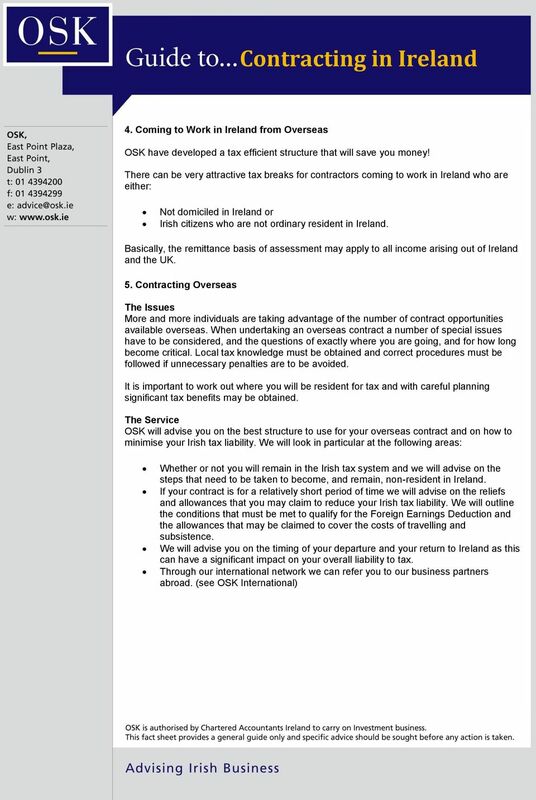 Contracting Overseas 1. Advantages and Disadvantages Advantages of Contracting More money Due to the short-term nature of the work, most employers are prepared to pay higher rates to contractors than to employees. 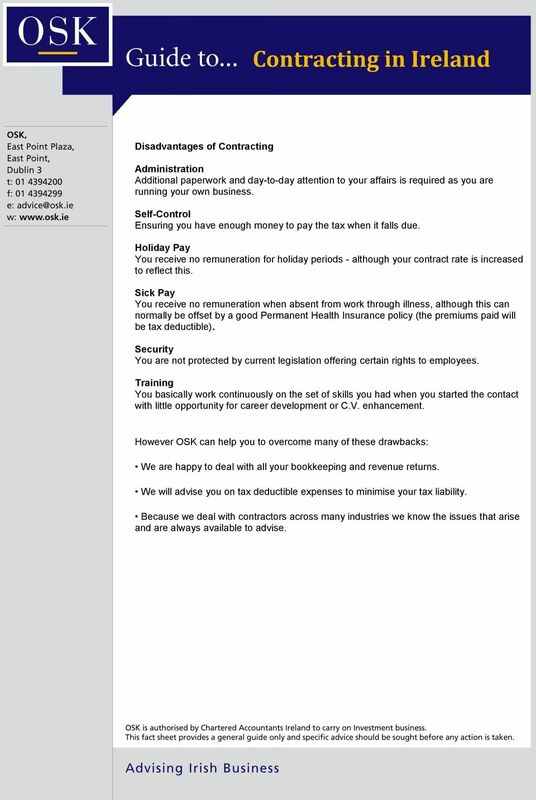 The employer benefits through savings in holiday pay, sick pay, redundancy etc. Variety The freedom to change jobs on a regular basis without the formality of notice and without associated blemishes in career history. Independence The satisfaction and independence of being self-employed. Holidays Not being fixed to set annual holidays. Having freedom to take extended holidays between contracts. Multi-Skilling Working in different software environments adds to your skills, thus making you more marketable. Travel Experienced contractors are marketable in many locations, both at home and overseas, which may give you the opportunity to travel. Tax Savings Possibility of organised tax planning through running your own business. Also, with tax not being deducted at source from your income, you can earn extra interest income. 2 Disadvantages of Contracting Administration Additional paperwork and day-to-day attention to your affairs is required as you are running your own business. Self-Control Ensuring you have enough money to pay the tax when it falls due. Holiday Pay You receive no remuneration for holiday periods - although your contract rate is increased to reflect this. Sick Pay You receive no remuneration when absent from work through illness, although this can normally be offset by a good Permanent Health Insurance policy (the premiums paid will be tax deductible). Security You are not protected by current legislation offering certain rights to employees. Training You basically work continuously on the set of skills you had when you started the contact with little opportunity for career development or C.V. enhancement. However OSK can help you to overcome many of these drawbacks: We are happy to deal with all your bookkeeping and revenue returns. We will advise you on tax deductible expenses to minimise your tax liability. Because we deal with contractors across many industries we know the issues that arise and are always available to advise. 3 2. Setting Up As a Contractor There are four main routes which an individual may follow when he or she has decided to enter a contract: Agency Employee The individual becomes an employee of the agency who then places him or her on a contract at the premises of a third party. Generally very few of the advantages or disadvantages mentioned earlier apply to agency employees and this guide does not attempt to outline procedures to be adopted by agency employees. Briefly the following points are relevant to agency employees: Earnings will be higher than those of direct employees, but will generally be approximately 12% lower than those contracting on a self-employed basis or through a limited company. This is because the agency will have to pay employers' Pay Related Social Insurance (PRSI) and this will generally be deducted from the earnings of the contractor. Full tax and PRSI will be deducted from earnings at source. 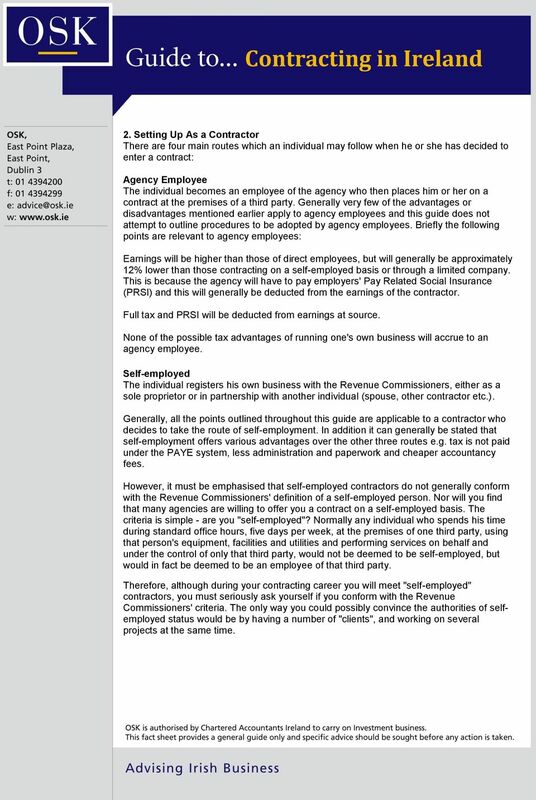 None of the possible tax advantages of running one's own business will accrue to an agency employee. Self-employed The individual registers his own business with the Revenue Commissioners, either as a sole proprietor or in partnership with another individual (spouse, other contractor etc.). Generally, all the points outlined throughout this guide are applicable to a contractor who decides to take the route of self-employment. In addition it can generally be stated that self-employment offers various advantages over the other three routes e.g. tax is not paid under the PAYE system, less administration and paperwork and cheaper accountancy fees. However, it must be emphasised that self-employed contractors do not generally conform with the Revenue Commissioners' definition of a self-employed person. Nor will you find that many agencies are willing to offer you a contract on a self-employed basis. The criteria is simple - are you "self-employed"? Normally any individual who spends his time during standard office hours, five days per week, at the premises of one third party, using that person's equipment, facilities and utilities and performing services on behalf and under the control of only that third party, would not be deemed to be self-employed, but would in fact be deemed to be an employee of that third party. Therefore, although during your contracting career you will meet "self-employed" contractors, you must seriously ask yourself if you conform with the Revenue Commissioners' criteria. The only way you could possibly convince the authorities of selfemployed status would be by having a number of "clients", and working on several projects at the same time. 4 Umbrella Company The concept of the Umbrella Company has become popular recently. An Umbrella Company is a halfway point between the agency employee and Limited Company routes. The Umbrella Company is set up and run by a third party (often a firm of Accountants). The contractor becomes an employee of the Umbrella Company and all invoicing, VAT returns, tax, administration, bookkeeping etc. are handled outside the control of the contractor. The contractor is paid a salary related to his earnings. The concept is directed primarily at contractors on foreign assignment and some contractors use it as a first step towards having their own company. Individuals who are on quite a low contracting rate and/or those who are going to contract for a short period of time, may find it cost effective to use an umbrella company. Limited Company Most contractors follow the route of forming a Limited Company on commencement of their career as a contractor. The advantages and disadvantages of this route are as set out in the previous section of this guide. 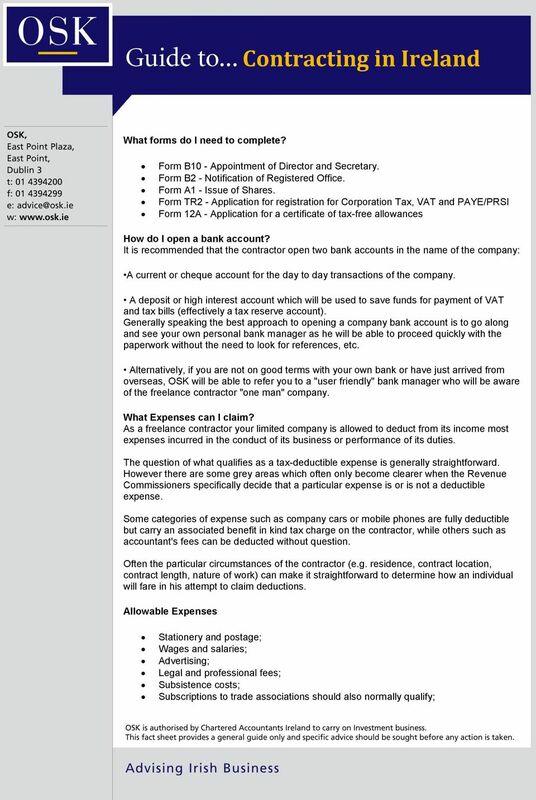 The contractor forms, or buys, a limited company. The limited company enters into a contract with the agency to provide specific services to a third party, and then the limited company employs the contractor to perform these services in fulfillment of its contract. The contractor generally will become a director and major shareholder of the company. This guide is specifically directed towards the contractor who has opted to follow the Limited Company route. 3. Operating through a Limited Company How do I form the Company? There are several ways in which a company can be formed. The most common routes are through a company registration agent or through an accountant or lawyer. You choose your own business name and specify the objects of the company. The company will then be created to your own requirements within about five to seven working days. The charge for our company start-up service includes all advice given as to the appointment of company officers and shareholders and completion of the initial registration form for VAT, PAYE/PRSI and Corporation Tax purposes. What Documents will I receive? Certificate of Incorporation: The birth certificate of the company setting out where and when it was incorporated, and its registered number. Memorandum and Articles of Association: The constitution of the company setting out the objects for which the company is formed and any restrictions on the conduct of its day to day business. 6 Business travel expenses Accountants fees; Subscriptions to trade-related journals and other sources of information; Telephone, light and heat We will advise on the expenses that may be claimed if you use your home for, business purposes and on whether or not you should purchase assets, (e.g. company cars) in the company's name. Professional books and journals - We will advise on the capital allowances that are available on the company's assets and advise you of any additional reliefs for which you may be eligible. Permanent health insurance; Pension contributions; Training costs; Computer related costs; Interest and bank charges Leasing costs (over the period of the lease); Repairs, renewals, etc. How is the Company money distributed? By Remunerating Yourself The contractor should pay himself a regular salary at a rate normally agreed at our initial meeting. Any funds left in the company at the end of the financial year should be paid out by way of additional remuneration. By Paying Third Party Expenses Certain expenses can be met directly from the company's bank account (e.g. 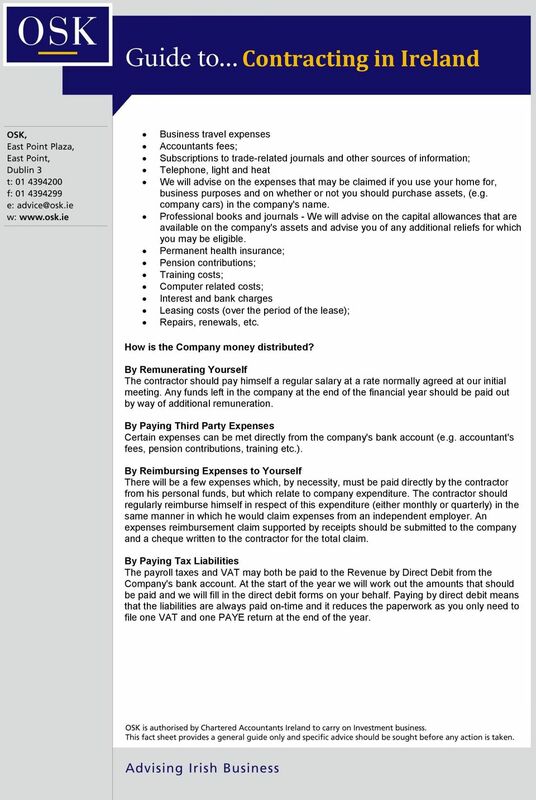 accountant's fees, pension contributions, training etc.). By Reimbursing Expenses to Yourself There will be a few expenses which, by necessity, must be paid directly by the contractor from his personal funds, but which relate to company expenditure. The contractor should regularly reimburse himself in respect of this expenditure (either monthly or quarterly) in the same manner in which he would claim expenses from an independent employer. An expenses reimbursement claim supported by receipts should be submitted to the company and a cheque written to the contractor for the total claim. By Paying Tax Liabilities The payroll taxes and VAT may both be paid to the Revenue by Direct Debit from the Company's bank account. At the start of the year we will work out the amounts that should be paid and we will fill in the direct debit forms on your behalf. Paying by direct debit means that the liabilities are always paid on-time and it reduces the paperwork as you only need to file one VAT and one PAYE return at the end of the year. How do I know if I m self-employed? A person is self-employed if they are gainfully employed but are not under a contract of service with an employer. You may be a sole trader or in a business partnership. Brightwater. Temporary Candidate Pack. Please find enclosed the information you will require when working as a temporary candidate for Brightwater. Financial Services Director: Nick Eveleigh C.P.F.A. This form is to be used where you do not have accounts, or if your income has changed since your last accounting period/set of accounts. Business Banking. Our business is banking, what s yours?